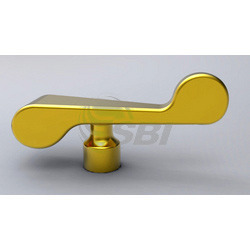 Owing to our vast industry experience and rich domain expertise, we are actively engaged in offering Brass Handle. The offered range of brass handles is manufactured utilizing finest quality metals and advanced machines in exact accordance with the international quality guidelines. In order to suit the variegated demands of the customers, we offer these handles in different grades, standards, finishes and other specifications. Since our inception in the year 1989, we, Siddhnath Brass Industries are an ISO 9001 : 2008 certified company and one of the leading manufacturers, suppliers and trader of a wide range of Brass Products and Components. These products have been developed by us keeping the industrial standards in mind. We have made use of the highest grade of raw material procured from reliable vendors, in the making of this range. Customers are in wide demand of these products as a result of its comprehensive and variegated features. In our offered range we have products such as Brass Inserts, Fire Parts, Forged Components, Auto Parts, Bushes, Sprinkler Parts, Transformer Parts, Components, Bolts, Washers, Ball Valves and much more. We export our products in Middle East, South East Asia, Indian Subcontinent and Central America. Our expert fabricators have manufactured these products at our manufacturing unit by making use of the best and highly advanced machines. We have a sophisticated infrastructure facility for the production of these products. Quality controlling unit, production unit, packaging unit and other miscellaneous units are the parts of our infrastructure. All our products are highly qualitative and availed to the customers at the most legit and market leading price range. These products are widely used in industrial processes of manufacturing various machines. Road No. I,Plot No. 3608,Phase 3,Dared,G.I.D.C.